Backed by an all-star ensemble that includes, among others, Billy Flynn on guitar, Johnny “Fingers” Iguana on piano, Bob Stroger on bass, Jimmi Mayes on drums, and Mervyn “Harmonica” Hinds on harp, Buck proves that he’s still one of the very best around with this collection of a dozen originals and five splendid covers, from the slow blues of Billy Flynn’s “Can’t Say Something Good About Me” and Leroy Carr’s “Blues Before Sunrise”, swaying “How Deep is the Ocean” (one of two Muddy Waters tracks here, along with “Please Have Mercy”), and “Crawlin’ King Snake”, to original gems like the strong, opening “You Want Me to Trust You”, a bit more sprightly “I Give So Much to You” that, contrary to its lyrics, gives much to be happy about, “The Men Ought to Learn (To Treat the Women Right)”, a simmering “Bottom of the Hill” with some particularly fine work from Iguana on piano, and another slow blues number in “Twenty-Four Seven”, closing out the album with a Jimmy Reed-ish “I’d Rather Love You” that’s a cross between a more loving take on “Sloppy Drunk” and “Baby What You Want Me to Do”. 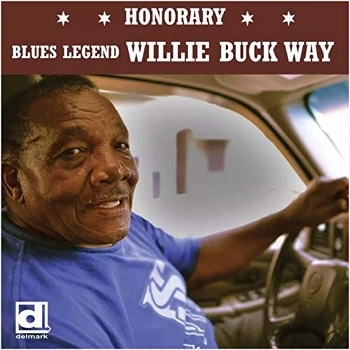 With its distinct Chicago sound, you’re going want to make sure you take a cruise down Willie Buck Way! This entry was posted in Albums and tagged Billy Flynn, Bob Stroger, Jimmi Mayes, Johnny Iguana, Mervyn Harmonica Hinds, Willie Buck. Bookmark the permalink.